DUBAI, Oct 9 2018 (WAM) – Dubai Cares, part of Mohammed bin Rashid Al Maktoum Global Initiatives, kicked off a three-year programme in Nicaragua, in partnership with Teach a Man to Fish, a non-profit organisation supporting schools across Africa, Asia and Latin America to establish student-led enterprises that are both educational and profit-making. 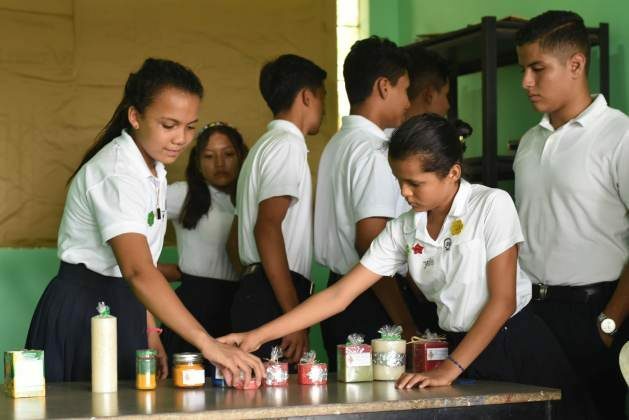 The AED 1,936,386 (USD 534,473) School Enterprise Challenge programme which targets the Caribbean Coast Autonomous Region (RACC), the most disadvantaged region in Nicaragua, is set to help 6,300 students across 165 schools gain skills, knowledge, and mindset for decent employment. In addition, the programme provides schools’ teaching and administration staff with the necessary skills and tools for planning and managing a school business. The programme is also supporting the Nicaraguan Ministry of Education (MINED) and a number of NGOs to help gender-balanced school teams in planning and setting up profitable school enterprises. Moreover, the programme aims to develop an efficient Management Information System (MIS) to support participating NGOs in their management of schools participating in the School Enterprise Challenge. Since its establishment, Teach A Man To Fish has assisted over 300,000 young people gain business, entrepreneurship, and other life skill through participating in planning and managing school businesses. In 2011, the organisation launched the School Enterprise Challenge to enable any school to replicate their school business model through step-by-step guidance and support. This programme works by developing profit-making businesses in schools which are run by students with the help of mentors. Over the course of a few years and with the scale-up of these businesses, the programmes will become self-sufficient and generate profits for schools ensuring their financial stability and encouraging economic growth in the surrounding communities. “Nicaragua has a large youth population and although the nation has made important progress in increasing access to primary and secondary education, the completion rates remain alarmingly low, as many parents in the country prefer their children to work and contribute to the household income. Through the School Enterprise Challenge programme, Dubai Cares highlights the urgent need for experiential and vocational training in entrepreneurship and business among Nicaraguan youth, as well as the importance of focusing on gender equality in employment. By empowering young boys, girls, and teachers with the skills required for meaningful employment, the School Enterprise Challenge programme addresses three of the Sustainable Development Goals including No Poverty, Quality Education, and Decent Work and Economic Growth, hence reiterating our commitment to impactful and sustainable solutions in education. The children and youth participating in this programme will gain invaluable life skills that will enable them to better support themselves and their families,” said Tariq Al Gurg, Chief Executive Officer at Dubai Cares. Nik Kafka, CEO and Founder of Teach A Man To Fish, said, “Teach A Man To Fish is enormously proud to be partnering with Dubai Cares to transform education for over 6,000 young people in 165 schools in Nicaragua. Our partnership in School Enterprise Challenge Nicaragua is driven by the aim to prepare young people better for success in school, in work and in life”. Nicaragua is the second poorest country in the Americas and ranks 124 out of 188 countries in the United Nation Development programme’s (UNDP) Human Development Index. More than 45% of Nicaragua’s 6.2 million people live in multi-dimensional poverty, while just over 20% of the population exist below the national poverty line despite working. The majority of poor Nicaraguans lives in rural areas and are employed in agriculture, the country’s main industry. Youth unemployment has been estimated at 12% in the Central American nation, with young people working in precarious low-wage positions in informal sectors. According to the UNDP, about 40% of the adolescents and young adults are either unemployed or working in informal sectors, with female youth accounting for a higher proportion of the unemployed youth population (69%).